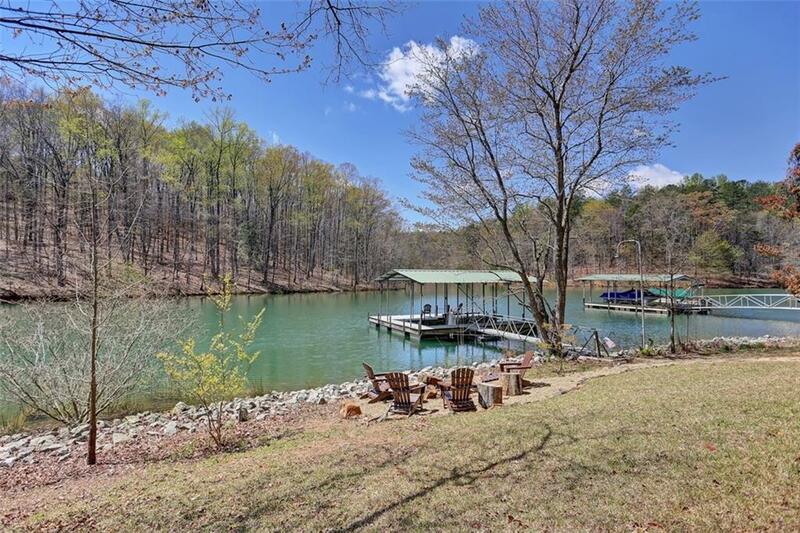 Lake retreat located approximately five miles from Clemson and less than five minutes to Seneca area restaurants, shopping and entertainment. This private, deep water cove allows you to bask in the tranquility of the lake while fishing, swimming or simply floating off your shore. The home offers an open living/dining floor plan with a soaring cathedral ceiling anchored by a large stone fireplace. Hints of rustic dÃ©cor add to the warmth of this getaway. The master bed and bath are located on the main floor with three additional bedrooms and full bath upstairs. Three of the bedrooms feature a private balcony that overlook the water and almost every room of the home offers emerald green lake views. There is a spacious back deck and screened-in porch for lounging close to the house or enjoying an outdoor meal. An outdoor shower with hot and cold water is conveniently located beneath the deck, for those who want to rinse off before heading inside. Several upgrades and renovations completed within the last year. Contact listing agent for a detailed list. This setting is so quiet and peaceful, you'll forget how convenient it is. Truly a must see to appreciate.